STUDENTS at the Chetwood Memorial Primary School in St James were yesterday urged to be “SMART online” as telecommunications firm FLOW conducted an online safety workshop with them. The acronym SMART is used globally to remind children of some basic rules while navigating the online space and represents the following Safe – which encourages them not to share personal information, Meeting – which cautions against meeting strangers online, Accepting – which warns against malicious emails and other content, Reliable – which urges them to double check their sources and Tell – which remind them to consult with a responsible adult. Garvin Atkinson, principal of Chetwood Primary, expressed gratitude for the timely intervention. 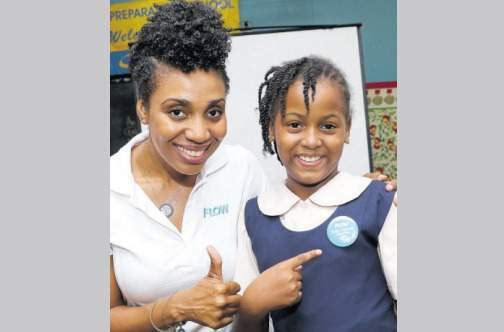 Following another workshop hosted with students at the Ocho Rios Primary School, Principal Suzette Barnes Wilson called on parents to do more to educate their children about safety online. “Parents buy these devices for the children and many of them are not aware of the dangers online and so they are not able to help their children,” Barnes Wilson commented. Kayon Mitchell, director of corporate communications & stakeholder management at FLOW, said that educating individuals, particularly youth, about responsible use of the Internet remains an annual priority for the company. “We are continuing the national conversation about Internet safety. While it provides many great opportunities to connect and create moments with our friends and family, like any other tool, responsible usage is encouraged especially among children. We also celebrate that more and more of our senior citizens are getting online. However, we recognise that they, too, may also face significant risks while navigating the online world,” Mitchell said. FLOW will also be leading the local charge within another at-risk stakeholder group in the online space — the elderly — while UNICEF has issued a poll via its U-Report social messaging platform to measure experiences and attitudes with regard to online safety among children and youth ages 13-29 across the island. Preliminary results of the poll, which was open until midnight Monday, highlight some major online risks. Forty-five per cent said they have agreed to meet up with someone they do not know, while 57 per cent admitted having “sexted” or received sexually explicit images. On the positive side, only 10 per cent said they would do nothing if they saw someone being attacked, threatened or victimised online. Following each training workshop the students are asked to complete the UNICEF Smart Connect quiz, also available online, which is used worldwide to help students and youth navigate the internet safely — to prevent risk and take appropriate action.